Compact, turnkey module achieves typical accuracy of ±0.05 % for both current and voltage measurement; measures temperature at 4 points. Accuracy is defined as the cumulative effect of all possible sources of error, including offset, gain and stability of the built-in precision voltage reference. 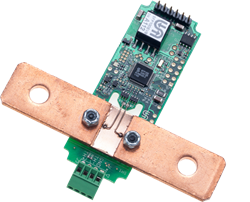 Sendyne has introduced the SFP100EVB, a turnkey module for precision measurement of current, voltage and temperature. Operating in the automotive temperature range of -40 °C to +125 °C, the module simultaneously measures bi-directional DC current through a 100 micro-Ohm resistive shunt, voltage and temperature at 4 points. The module is capable of resolving currents from 3 mA to 513 A within a single continuous measurement range (without sub-ranging or gain switching), with uniform resolution of 61 µA, and performs automatic charge accumulation for built-in precision Coulomb counting. A complete evaluation kit for SFP100EVB is available that includes the module, a Serial-to-USB cable, as well as Windows’-based control software. The software (downloadable here) provides visual indication of all measured values, both in digital-meter and real time chart formats, as well as automatic saving of all data in files (data logging), with unlimited duration, for off-line review and export in an ASCII format. Furthermore, it allows assessment and control of all internal registers and settings for the SFP100 IC utilized by the module. Evaluation kits can be purchased directly from Sendyne. For more information or to obtain a datasheet, please contact Sendyne at sensing(at)sendyne(dot)com.